Visiting some of the finest gardens in Italy, this wonderful two-week walking tour of Piedmont will show you the full diversity of one of the most fascinating regions of Europe. In a succession of gentle walks, we will explore the UNESCO-listed royal palaces and gardens in and around Turin (ruled by the Savoy family for nearly 800 years); the vineyards of Le Langhe (one of Italy’s finest wine-producing areas, also UNESCO-listed for its unique landscape and traditions); an extraordinary new nature reserve in the Alps (once a hunting demesne of the Savoy); and finish with the luxuriant gardens of Stresa and the Borromeo Islands on Lake Maggiore (the most romantic of the Italian lakes). The House of Savoy is one of the oldest royal families in the world and they were nothing if not aspirational. With each step up the aristocratic ladder achieved, the Savoy deployed their vast wealth and resources to embellish the palaces and gardens of their realm, using some of Italy and Europe’s finest architects and artists. While the Savoy heritage will be central to the tour, it will not be all palaces and formal gardens! We will also visit stately parklands; one of Italy’s oldest botanical gardens (in Turin); one of its highest (above Lake Maggiore); one of its newest nature reserves, representing the state of the art in restoration ecology: the Zegna Oasis; and the lush private gardens of the Italian lakes, as well as staying on one of the country’s best vineyards (in the Langhe). The accommodation is one of the highlights of the tour. We spend three nights in four different places: a chic 4-star hotel in a historic building in one of Turin’s most beautiful residential areas; a beautiful vineyard, the family estate of an ex-president of the Italian Republic in the Langhe; a magnificently restored aristocratic home in the verdant countryside at the foot of the Alps; and a lovely family-run hotel on a picturesque island on Lake Maggiore, whose visitors have included Toscanini, Hemingway, GB Shaw, the Emperor of Japan and Charles and Diana! The walks are walks, not hikes! They will enable you to experience first-hand the stunning gardens, parklands and natural heritage of this beautiful and diverse region. They include strolls through ancient and modern formal gardens, two walks through some of Italy’s finest vineyards, a day exploring the high-altitude wetlands of the Alpine Valle d’Aosta (or alternatively, the museums, monuments and shops of Aosta, the northernmost city in Roman Italy and now the centre of one of the country’s most vibrant regional economies), an amble around Lake Orta and an easy walk through an alpine botanical garden high above Lake Maggiore. The walks range in length from four to sixteen kilometres, follow good paths and can be shortened or skipped, if you wish. Piedmont cooking may have certain refinements (it does after all border with France and there has been a flourishing exchange of gastronomic ideas going back some 800 years under the Savoy) but it is deeply rooted in a tradition of simple wholesome cooking. It relies on first class, very tasty ingredients: truffles, garlic, game and crisp vegetables, together with cheese and rice, are the bases of Piedmont specialties, and are accompanied by some of Italy’s finest wines. Apart from excellent meals in a variety of settings, two of the highlights of the tour will be having our own chef for two of the three nights in the Langhe and dinner in a private home on Lake Maggiore on the last night. Paul designed and leads the spring garden tours in Tuscany and Piedmont. Paul is an art historian, author (including the Blue Guides to Piedmont, Northern Italy and Southern Italy and the Art/Shop/Eat series for Venice, Milan and Florence, among other things) and is a long term resident of Tuscany. He is an active visual artist and has taught painting, drawing and the history of Modern art at the European study centres of several American universities. In recent years he has become increasingly involved with landscape design, developing large-scale projects in Tuscany and the Dolomites. 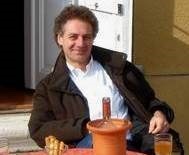 He has designed and led walking tours in Italy since 1994. He is also a very nice guy! He lives with his family in Fiesole in the hills above Florence. "Paul Blanchard was superb, such a fun, informative caring man..... passionate about his subject and fantastic on imparting his knowledge...what an amazing trip we had!" S and G Richards, Gardens of Tuscany.